After receiving an MBA from Columbia University, Lewis was a high-performance marketing director at several multinational consumer package goods companies for 25 years, where she launched product lines, developed advertising campaigns, and guided businesses to unprecedented sales levels. In 2012, she channeled her professional expertise and business savvy into the merchandise vendor arena, where she has since become a successful “vendorpreneur” at anime, manga, comic and sci-fi conventions. 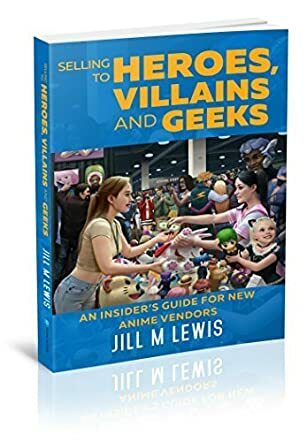 Selling to Heroes, Villains and Geeks: An Insider’s Guide for New Anime Vendors is a nonfiction business/finance book written by Jill M. Lewis. The author earned her MBA at Columbia University and is a marketing professional as well as a vendor at Anime, Comic Con and Sci Fi conventions. Lewis first sets out her Cardinal Rules for getting ready to become a vendor, which include foregoing your own favorite items in favor of those that customers are looking for, something that can be quite difficult for new vendors to accept. The second part of her guide includes a series of assignments for the reader which show, step-by-step, the processes involved in finding out what is trending in the anime universe, how to build up a varied stock, and how to negotiate the international websites where prime items are to be found. Lewis then walks the reader through the application and permit processes, preparation and setting up, and selling at a typical convention. She includes an appendix with links to suppliers and a sample convention vendor’s application. Jill M. Lewis’ nonfiction business/finance book, Selling to Heroes, Villains and Geeks: An Insider’s Guide for New Anime Vendors, was of particular interest to me as I had been a vendor at conventions and fairs and trade shows in the past and have been looking for a better product/service niche than the ones I had previously explored. As I began reading, I was quite impressed by and intrigued with the ideas, advice and support Lewis provides to those considering becoming an anime vendor, or for that matter, anyone who is currently a convention/fair vendor who is not doing as well as they had envisioned. Her ideas make a lot of sense, and I particularly like how she steers her readers to one-of-a kind and collectible items. While the author doesn’t promise instant success with a minimal amount of preparation and work, she does provide, in a well-written, interactive and highly accessible format, information, strategies and instruction that can help new vendors supply, design and set up a dynamic, unique and successful anime display. Selling to Heroes, Villains and Geeks: An Insider’s Guide for New Anime Vendors is most highly recommended.